View and order all our CDs here! Putumayo World Music was established in 1993 to introduce people to the music of the world’s cultures. With colourful eye catching presentation and informative booklets about the musicians, our CDs make great gifts. Putumayo provides retailers with upbeat and melodic CD collections of music from Jazz & Blues to French, Latin, African & more. Sourced from many countries around the globe they contain a beautiful mixture that will get you moving and feeling good. Create a great ambience in your store and enhance your customers' shopping experience while creating extra income. We can tailor your selection to suit your theme, whether its a Book Store, French Provincial, Kitchen, Home-wares, Fair trade or Health & Whole food stores, just to name a few. It's been proven that customers will stay longer and spend more when great music is played in store. Putumayo Kids introduces children to other cultures through its best selling CD collections that entertain, educate and inspire curiosity about the world. The songs are carefully selected and feature child-friendly lyrics and rhythms by exceptional international artists. Putumayo Kids CDs make learning fun, they are very popular with teachers and parents too. Our CDs make great gifts and include an informative booklet and some include recipes. We offer a "no-risk trial" and our CDs are "Guaranteed to make you and your customers feel good!" 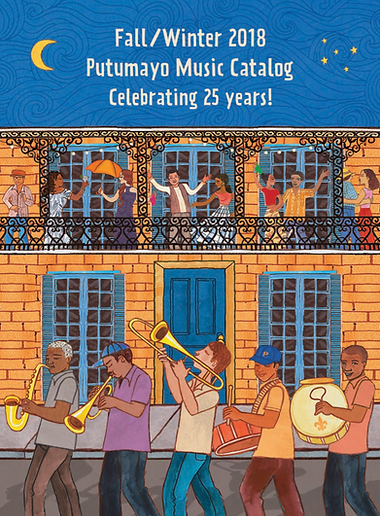 Click this link jon@putumayo.com.au for information about becoming a Putumayo World Music stockist. Register for Wholesale We will contact you when your account is approved. Interested in selling Putumayo in your shop on a 60-Day No-Risk trial? Click here!